FREE with purchase of AllBrands embroidery machines starting April 2018. What every embroiderer should know about stabilizers. Designs in Machine Embroidery is excited to bring you the first in a series of DVD's that will get new embroiderers off to a great start and build confidence in seasoned embroiderers. Embroidery expert Deborah Jones takes the mystery out of stabilizer. She puts in plain words exactly how to stabilize even the most "scary" fabrics. The 30-minute DVD is chaptered so you can watch the whole thing or quickly navigate to the exact spot that covers the fabric and stabilizer for a specific project. Handy printable reference sheets are also included on the DVD. 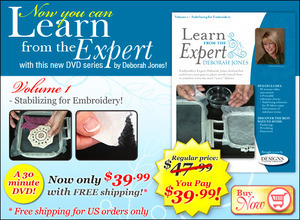 Preview of Learn from the Expert by Deborah Jones - Stabilizing for Embroidery 30 Minute Video DVD. Designs in Machine Embroidery is excited to bring you the first in a series of DVD's that will get new embroiderers off to a great start and build confidence in seasoned embroiderers. 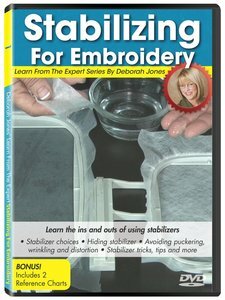 Embroidery expert Deborah Jones takes the mystery out of stabilizer. She puts in plain words exactly how to stabilize even the most "scary" fabrics. The 30-minute DVD is chaptered so you can watch the whole thing or quickly navigate to the exact spot that covers the fabric and stabilizer for a specific project. Handy printable reference sheets are also included on the DVD. Complimentary Video Previews from Deborah Jones on Other Learn from the Expert Series of Books and DVD's. Deborah Jones explains the different types of Soluble Stabilizers. Designs in Machine Embroidery's-- Ask the Expert columnist, Deborah Jones explains the different types of Soluble Stabilizers. Learn from the Expert DVD 3 - By Deborah Jones. Embroidery expert, Deborah Jones, shares her unique methods to achieve professional results on towels and plush materials. Your projects will look great and last for years. Finally, you can look forward to predictable, beautiful results on towels, fleece blankets and much more. No more list stitches! Learn from the Expert DVD 4 - Repairing Embroidery Mishaps by Deborah Jones. 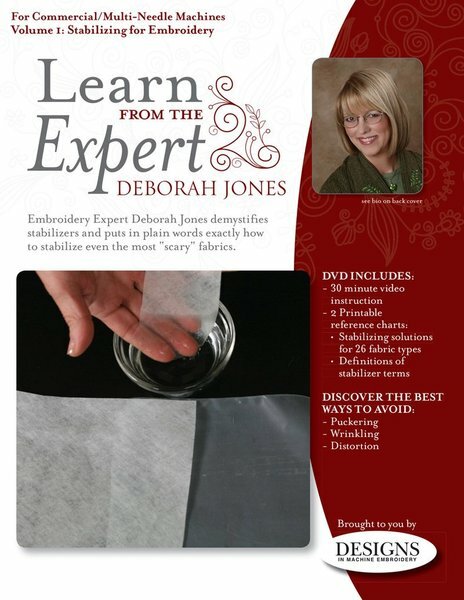 Now you can Learn from the Expert with this new DVD seriesby Deborah Jones! Volume 4 - Repairing Embroidery Mishaps/ Deborah has decades of experience in embroidery - so she's made her share of mistakes. Join Deborah as she shows you how to turn those "oops" moments into success. Applique FUNdamentals - by Deborah Jones. Designs in Machine Embroidery is excited to bring you the second in a series of skill-building DVD's that are sure to put new embroiderers at ease and build confidence in seasoned embroiderers. Appliques are quick-stitching and provide impressive results. Follow along with embroidery expert Deborah Jones in this 30-minute DVD as she shares timesaving tips and simple steps that make machine appliqué easy and fun. Deborah Jones, the Ask the Expert columnist for Designs in Machine Embroidery, has just released her book, Machine Embroidery on Difficult Materials. Watch video for a preview of her book. Ask the Expert, A machine embroiderer's handbook by Deborah Jones. Ask the Expert A Machine embroiderer's handbook is a compilation of articles featured in Designs in Machine Embroidery magazine. Organized for easy reference this book will serve as a handy resource to anyone just learning how to machine embroider or anyone who wants to sharpen their embroidery skills. Learn from the Expert DVD 5 - Hooping for Success by Deborah Jones. by Deborah Jones! Volume 5 - Hooping for Success is now available. Exquisite offers only th highest quality backings and stabilizers available. Exquisite products are developed exclusively for the embroidery industry and are not leftovers form products designed for other uses. Exquisite offers only the highest quality backings and stabilizers available. Exquisite products are developed exclusively for the embroidery industry and are not leftovers form products designed for other uses. Back is the foundation for all great embroidery designs. It provides stability and keeps the material from shifting during stitching. Because there are almost as many different backings as there are applications, Exquisite offers a complete line to meet all of your embroidery needs. The key to great embroidery is equal tensions on the fabric in all directions while the fabric is in the emboirdery hoop. Ideally, a taut, tambourine feel should be achieved. This way, for each movement of the embroidery achine, you will have an equal movement of the fabric. Most Exquisite backings are made from non-directional materials, providing equal tension in all directions, and have silicone to help lubricate the needle during embroidery, minimizing thread breaks. When deciding which backing to use, consider the fabric on which the design is being stitched, the stitch count and the density of the design. Since different fabrics require different support or stabilization- the more stretch in the fabric, the more stabilizer required. However, thicker is not necessarily more stable. In addition, multiple layers of stabilizer may not add any stability. A single layer of Exquisite stabilizer is usually all that is needed. Back is the foundation for all great embroidery designs. It provides stability and keeps the material from shifting during stitching. Because there are almost as many different backings as there are applications, Exquisite offers a complete line to meet all of your embroidery needs. The key to great embroidery is equal tensions on the fabric in all directions while the fabric is in the emboirdery hoop. Ideally, a taut, tambourine feel should be achieved. This way, for each movement of the embroidery achine, you will have an equal movement of the fabric. Most Exquisite backings are made from non-directional materials, providing equal tension in all directions, and have silicone to help lubricate the needle during embroidery, minimizing thread breaks. When deciding which backing to use, consider the fabric on which the design is being stitched, the stitch count and the density of the design. Since different fabrics require different support or stabilization- the more stretch in the fabric, the more stabilizer required. However, thicker is not necessarily more stable. In addition, multiple layers of stabilizer may not add any stability. A single layer of Exquisite stabilizer is usually all that is needed. Deborah Jones is an accomplished embroiderer who has been in the industry for more 30 years. As the creator of instructional books and DVDs, and an expert columnist in Designs in Machine Embroidery and Stitches magazine, Deborah is a knowledgeable source when it comes to embroidery. Deborah has collaborated with EmbroiderBuddy®, creating instructional videos about how to use our products. We recently sat down with Deborah to learn more about how she got started with embroidery and her company, My Embroidery Mentor. Donna: How old were you when you learned to embroider? Do you remember your first project? Donna: Why did you decide to start embroidering for a living and when did you start your company? Deborah: I inherited my father’s embroidery machines and continued his business, specializing primarily in embroidery on leather goods. Donna: Where did you get the idea for My Embroidery Mentor? Deborah: There is very little formal instruction for embroiderers. I had to figure things out for myself so I’ve always been happy to share what I’ve learned with other embroiderers. My Dad had a yellow tablet taped to the wall of his embroidery shop and when he figured out something new, he would write it on that tablet. I want to take it a step beyond that. Donna: Who is your mentor (or who inspires you most) and why? Deborah: My Mentor was Shirley Landers, who taught me to always try to do my embroidery a little better, to make it a little more perfect. She taught me how to do manually-guided machine embroidery – a skill that has made me a better embroiderer overall. Donna: What tools and equipment would you recommend for someone wanting to become a home embroiderer? Deborah: I recommend a dependable embroidery machine, regardless of number of needles. You can do high-quality embroidery on a single-needle or a multi-needle machine. Buy the best thread you can find and never compromise on the quality of your stabilizer or other supplies. Donna: Please share a few tips you’ve used to help market your business. Deborah: Over the years, I’ve used everything from short radio spots to participating in the local Chamber of Commerce. But today, you can market your business from your home using your computer. I’m continually amazed by the power of Facebook and Etsy for promoting a small embroidery business. Donna: What’s the one piece of advice you’d give other aspiring entrepreneurs in the embroidery field? Deborah: Create exquisite quality and charge what it’s worth. Try to achieve a balance of producing your very best quality without spending an unreasonable amount of time to produce it. Follow this formula and you will become an embroiderer of choice in your area. Donna: What would surprise people most about you? Deborah: I don’t like to sew. Donna: What else do you do when you’re not taking embroidering or mentoring embroiderers? Deborah: I foster rescue dogs and enjoy classic cars and trucks. Deborah Jones is a second-generation embroiderer and author who loves creating dimensional embroidery techniques. Jones has managed large production shops and her own small embroidery businesses. She currently makes videos and produces embroidery events from her studio outside Dallas, Texas. Deborah can be found on her website, My Embroidery Mentor. Ricky Tims Exquisite H6208511 50 Sheets Stable Stuff Embroidery Stabilizer 8-1/2x11"